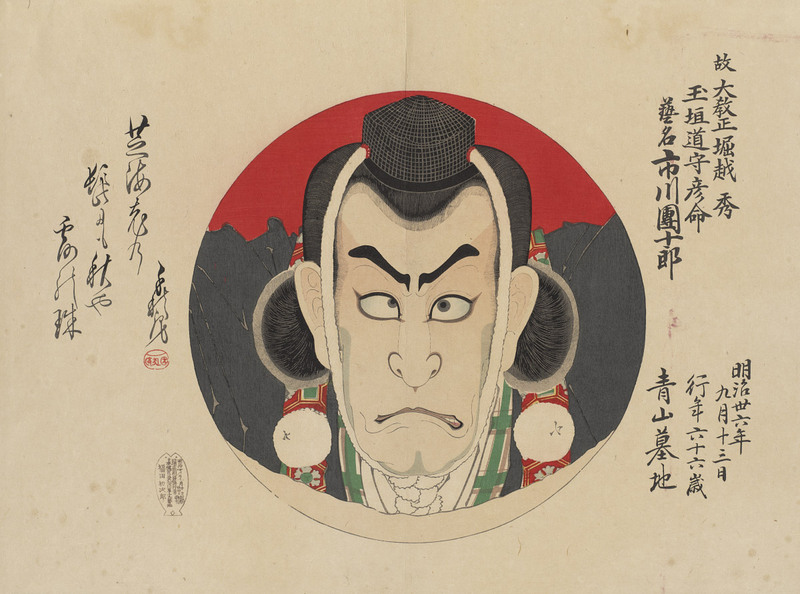 Tōshūsai Sharaku (Japanese, active 1794–1795), Onoe Matsusuke I as Matsushita Mikinoshin in the play A Medley of Tales of Revenge, 1794, Color woodblock print with mica on paper, The Mary Andrews Ladd Collection, 32.320. 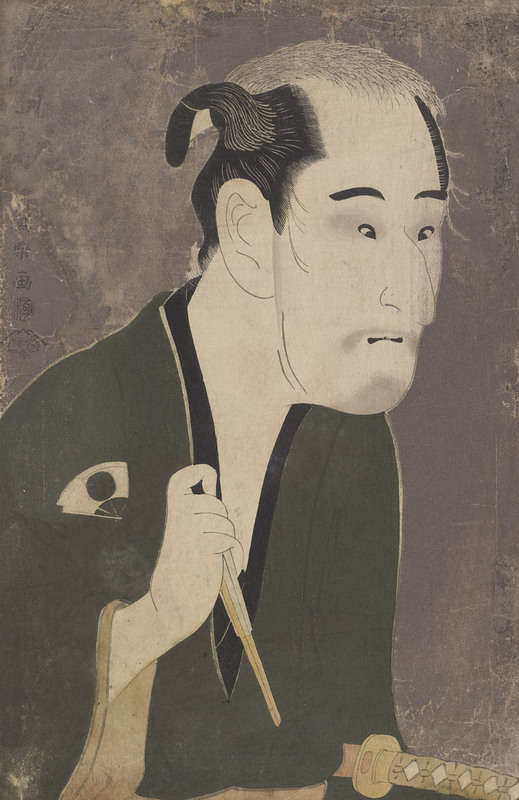 Toyohara Kunichika (Japanese, 1835–1900), Memorial Portrait of Actor Ichikawa Danjūrō IX as Musashibō Benkei, 1903, Color woodblock print with embossing on paper, Museum Purchase: Margery Hoffman Smith Fund, 2003.41.2. Woodblock prints of actors on the kabuki stage began to flourish in the late seventeenth century in Japan’s great cities. A quintessential form of urban entertainment, kabuki brought to life vivid scenes from dramatic storylines, at turns hilarious, tragic, breathtaking, or bawdy. Pictures of actors, oryakusha-e, were inextricably tied to the world of theater and the fan culture it promoted. Printed portraits could highlight exciting moments of suspended action or dramatic tension. Above all, they captured the distinctive poses of an actor, making the actor iconic through his most characteristic expressions and recognizable roles. Drawn from the Museum’s collection, Dramatic Impressions: Japanese Actor Prints offers a glimpse into this culture of celebrity, bringing together 37 actor prints from the 18th to 20th centuries. Kabuki theater was originated by itinerant female actors. In its early decades, it was performed exclusively by female actor troupes, until the Tokugawa shogunate banned women from the stage. From 1629, male actors played both male and female roles. Performances were staged from morning to sunset in kabuki playhouses, drawing a diverse crowd of townspeople. Filled with villains, heroes, and tragic lovers, kabuki’s grand performances offered all the emotional thrills of great drama: sensational plots, elaborate and stylized costuming, sophisticated music and dance sequences, and the powerful performances of superb actors. An actor’s name was central to his status as an icon. The names of the most famous, like Segawa Kikunojō or Ichikawa Danjūrō, would be passed on to worthy successors. These actor lineages were an important system for training talented apprentices, but they also reinforced a cult of celebrity. Luminaries of the stage became idols to avid fans: actors’ poetry, fashion, and tidbits about their life offstage were scrutinized by audiences eager to know more about their favorite stars. The publishing industry worked hand-in-hand with the kabuki theaters to promote this celebrity culture. Nearly all of the prints in Dramatic Impressions are on view for the first time, including many recent acquisitions and rare masterpieces seldom displayed. Organized by the Portland Art Museum and curated by Jeannie Kenmotsu, Ph.D., The Japan Foundation Assistant Curator of Japanese Art.